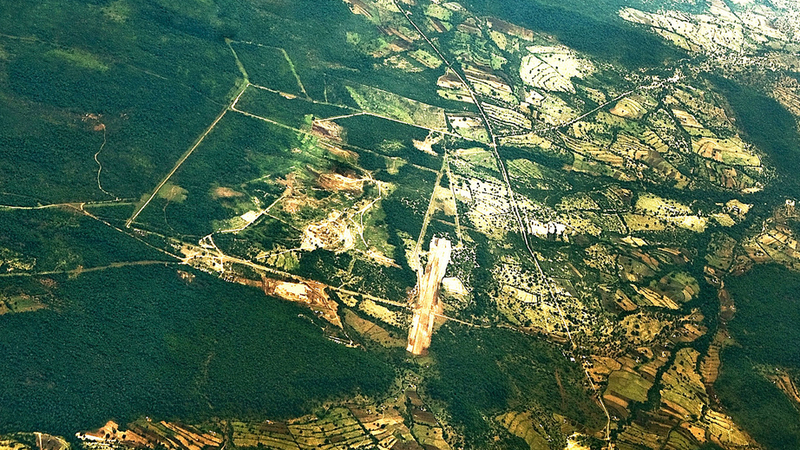 A secret airstrip was built in a diamond field seized by the Zimbabwe army in 2007. Zimbabwe has long struggled with diamond mining exploitation from foreign companies. Photo by Aristocrat’s Hat via Flickr CC BY-NC-ND 2.0. The quiet return of expelled Chinese mining company Anjin Investments to diamond fields located in eastern Zimbabwe have sparked concerns of exploitation of Zimbabwe’s resources under President Emmerson Mnangagwa’s administration, natural resource experts have said. The state restored Anjin’s license following intense pressure on Harare by Beijing, and the company has begun setting up operations earlier this month. Anjin Investments is a joint venture between the Anhui Foreign Economic Construction (Group) Co Ltd (Afec), and Matt Bronze Enterprises, formed by Zimbabwe’s defense ministry and the Zimbabwe Defence Forces. Anjin Investments and other diamond companies were stopped from mining the diamond fields located in Marange by former President Robert Mugabe’s government in 2016 following allegations of failing to remit taxes. Marange is a diamond-rich area located 400 kilometers east of the capital Harare within Manicaland Province. Zimbabwe’s office of the auditor general and parliament noted that Anjin Investments had never produced financial statements to account for its diamond mining operations. According to a parliamentary report on record, between 2010-2015, Anjin produced approximately 9 million carats which generated about $332 million United States Dollars in revenue. Out of that figure, $62 million USD went to the government as royalties and 86 million USD was spent under corporate social responsibility. However, due to its military connections, Anjin Investments constructed a defense college at a cost of $98 million USD. The company was one of the seven companies that were permitted to operate in Marange diamond fields prior to the consolidation of the mines in 2016. The other companies included Mbada Diamonds, Diamond Mining Corporation (DMC), Jinan Investments, Marange Resources, Kusena and Gye Nyame. Government-owned a 100% stake in Marange resources and 50% in the other six diamond-mining entities in Marange. These companies were forced into a merger to create the Zimbabwe Consolidated Diamond Company (ZCDC), but Anjin resisted the move. Anjin and Jinan were negatively affected by the merger, angering Chinese authorities who viewed the move as an assault on property rights and a violation of the investment agreement companies shared with the government. When Anjin left Marange, they dismissed hundreds of workers without paying their outstanding salaries and severance packages. The company was accused by its employees of racism and abuse of workers. Lack of transparency regarding the return of Anjin, therefore, raises these questions, who authorized them to mine in Marange? Why were formal government institutions overlooked? Anjin joins ZCDC, which has also been plundering Marange and committing horrific human rights abuses without any tangible benefits to the community. Chibuwe village is located within Manicaland near Marange, situated at the deep end of the Save Valley. Omen Dube, provincial mining director for Manicaland, expressed ignorance about the presence of Anjin when contacted for comment. Anjin is one of the companies we are in discussions with but no decision had been made on their return. The government’s move to re-select Anjin Investment along with the Russian company Alrosa as the two foreign diamond-mining companies signals a red flag to those fighting corruption and human rights abuses in Zimbabwe. How can a company mine diamonds from 2010 to 2015 and fail to produce audited financial statements, a basic integrity requirement? Between 2005 and 2016, as much as half of all outbound Chinese investment went into the extractive sector, according to Quartz Africa. A third of those funds have come to Africa, where the highest numbers of Chinese mines are found in South Africa, Zambia, Zimbabwe, and the Democratic Republic of Congo. The mining sector has been the core driver of Chinese investment in Zimbabwe, and indeed the rest of Africa. Diamond mines were, in fact, the source of China’s growing concerns about the Mugabe regime’s indigenization policy, which required 51% local ownership of foreign businesses. The Centre for Natural Resource Governance, a natural resources governance watchdog based in Harare, said that China must ensure that its companies in Zimbabwe, Anjin in particular, comply with the laws of Zimbabwe and get social licenses from the communities where they intend to operate. It is also important for China to ensure its companies are transparent and accountable to the local populations and the government of Zimbabwe. Anjin investments will soon pour $20 million USD to resume diamond mining operations. Full throttle extraction is expected to commence by the end of May 2019.